When I wrote my last letter to you I was quite prepared, not only not to write for four days, but not to write another for about forty or four hundred. The truth of the whole matter is that some time ago they officially informed us that we were at length to do an attack, & the next day told us what we were to attack. This was nothing less than a most formidable affair which we had already had a go at twice before. So for the last week we have been practising all kinds of manoeuvres new & strange to us, but such as are commonly practised by those about to attack the enemy. Then we came up & viewed the situation, & then yesterday after a heavy bombardment we attacked. The 5th were in support & so suffered least. Col. Martin of the 4th was wounded in the knee early on in the assault & stayed for twelve hours directing operations, although quite unable to move. None of his Officers have escaped unwounded. The other two battalions are in the same condition having three officers wounded between them. Thank goodness our C.O. is alright tho’ Toller has concussion. Hastings & Langdale are both killed – Petch, Lawton, Thomson, Wynne, Marriot, Moss, are wounded. Williams was hit but after being dressed he returned to work. 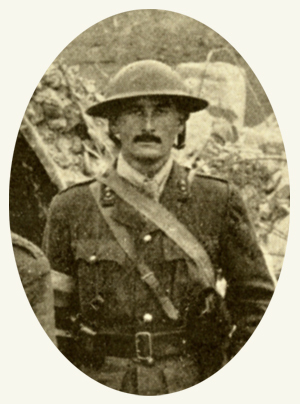 Wollaston, though wounded in the back & arm rallied weary men, & collecting a few enthusiasts led a successful bombing party, working on for four hours after his wound. I escaped without a scratch; why I don’t quite know. I went up to observe & missed every shell, then finding a rabble coming back I sallied forth in true theatrical manner & walked about in our newly captured line, finally, as I say, returning unscathed. Well, we have the Bosch trench but our casualties have been heavy — so have his for that matter. One thing is certain & that is that they will have to give us a rest now, simply because we have none to go on with. I don’t know much about the men’s losses but if they are in the same proportion as their officers we have not got many of them. The weather is now quite good though at times it gets remarkably misty. Once we get out to rest leave ought to start again so I have great hopes of visiting Bromley before too long. The Colonel has behaved most splendidly during the show & most certainly deserves a mention in dispatches, while there are great hopes of a Military Cross for Wollaston, I hope he gets it. Allen much to his annoyance had to go sick just before the battle, & was consequently out of it all. This means that at least we have an Adjutant left. P.S. I thought it best not to inform you of the coming fray, there was no need to cause a scare & I was afraid you might worry. Does anyone know what the “manoeuvres new & strange him, but such as are commonly practised by those about to attack the enemy” were in detail? This would have significance for the Butcher and Blunderer debate. If the manoeuvres were ‘commonly practiced’ then perhaps they may reflect that little innovation was being attempted and (pre-1914?) manoeuvres were still being used. But if they were ‘new and strange’, then innovation was being attempted. Needless to say, all techniques were doomed to failure. My heart goes out to them. No technique known to man could have rescued an attack, in 1915, over flat ground with enfilading machine-gun fire. I was not there. I won’t condemn. Unfortunately I can shed no concrete knowledge as to exactly what Hill meant by “manoeuvres new & strange, but such as are commonly practised by those about to attack the enemy”. There are four more letters to be published in October and Hills refers to the Battle of Hohenzollern Redoubt in all of them but goes into no more details about this particular subject. Thanks for your comment and you continued following of Captain JD Hills letters. Have you compared this entry with what he writes in his book about the regiment? Sometimes it is interesting to read the two different versions of the same event – both are written for very different audiences. I haven’t done this myself yet, but it may shed some light on your question. I am glad that you are finding the letters interesting.